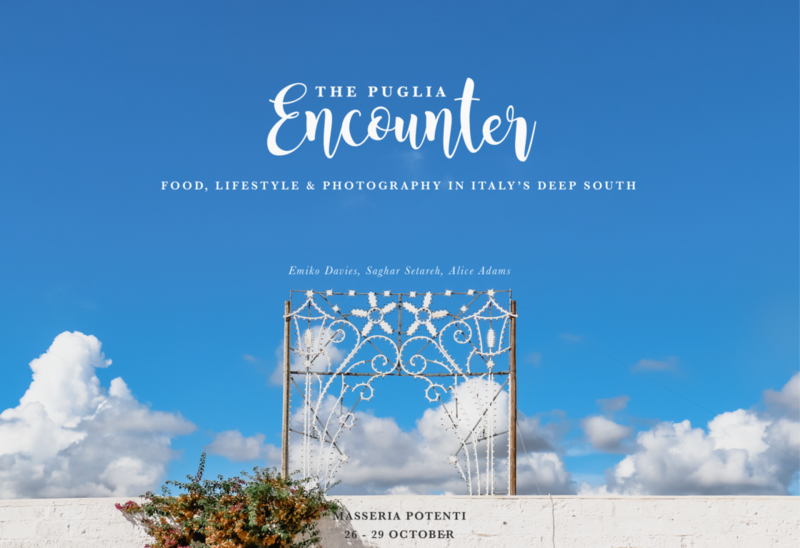 Who: This is ideal for anyone who is interested in travel, food and photography, creatives, food writers, travel writers, bloggers wanting to learn more or fill a portfolio full of inspiring images and stories and anyone who simply wants to spend a few wonderful days with like-minded people exploring and enjoying this incredibly authentic part of Southern Italy. Not included: Airport transfers, which can be arranged by the Masseria (Brindisi is the closest airport). For payment and booking: A deposit of 50% to register for the workshop with final payment due by 15 October, 2017. To book and send deposit (by bank transfer) please email Chiara at info@masseriapotenti.it and please let us know when booking if you have any allergies or dietary requirements. 10 am – coffee and morning tea with an introduction to the photography session by Sagar, followed by cooking session, styling and photography in three groups with Emiko, Alice and Sagar.